Users don't have to be doomed to the nightmare of software fraught with defects that should have been fixed before release. Time spent testing now can save you from the Death Spiral later. Remember: If you don't have time to do it right, how will you have time to do it over . . . and over . . . and over? So much more than a bucket for your errors, exceptions can be a valuable tool that lets you communicate to your clients not only that there is a problem but why and where the code failed. Ever wondered why one team's automated tests pass but your tests of the same software fail? Jonathan Kohl has an explanation. Perhaps we should all take a page from Marvin Gaye's songbook and test our project ideals in real-world environments. After all, "there ain't nothin' like the real thing." Software integration is never an easy task, and a good integration testing process is the key to success. This introduction to integration testing will help you identify what to test, typical faults to look out for, and effective means to uncover these faults. There is more to software development problem solving than processes and tools. Discover a way to get to the heart of a problem with none of the hacks, shortcuts, and workarounds that have become the industry norm. You know that old saying that the best way to schedule software development is to come up with your best guess and divide by three? 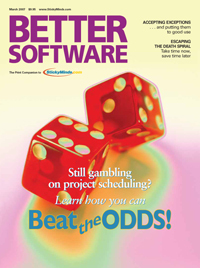 In this article, Joel Spolsky explains how to take the guesswork out of estimations by simulating schedules and creating probability curves that are more than just a shot in the dark. In this month's Test Connection Michael Bolton recounts a valuable lesson he learned early in his testing career: What's the best way to test a product? Use it yourself. It's happened again. Your boss corners you and pressures you to take on extra work. The additional project gives you more work than you can realistically do, let alone do well. Find out how you can stand up to your boss and work with him to create reasonable priorities for your time without damaging your relationship.